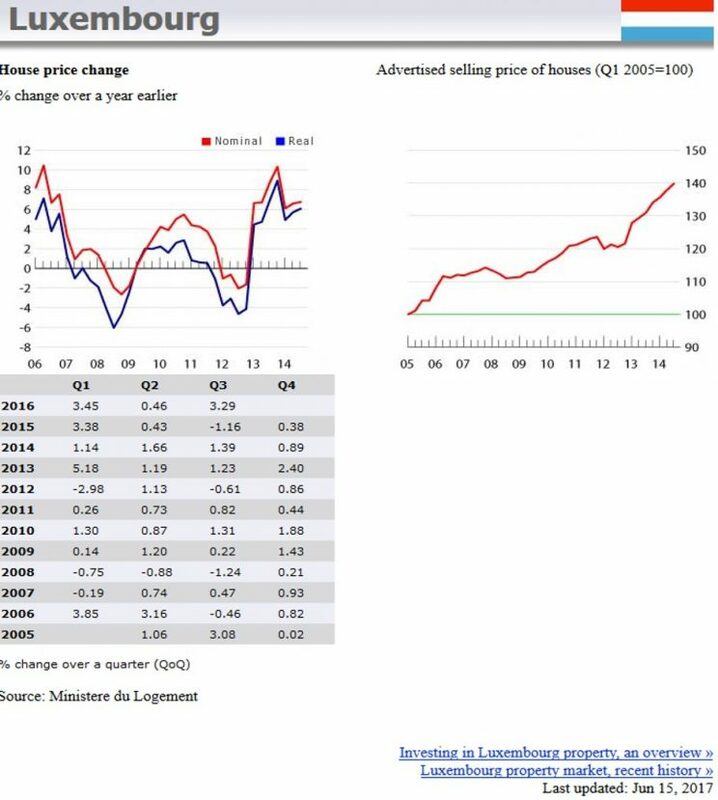 The average price of houses soared by 7.75% (7.57% inflation-adjusted) during the year to Q3 2016, according to the Ministere du Logement, after slower y-o-y growth in the first two quarters: 3.11% in Q2, and 3.07% in Q1. Apartment selling prices increased by 7.53% y-o-y (7.35% inflation-adjusted) in Q3 2016, following robust price rises of 5.37% and 6.31% in Q2 and Q1 2016, respectively. During the latest quarter, house prices were up by 3.29% (3.35% inflation-adjusted), apartments were up by 2.86% (2.92% inflation-adjusted). 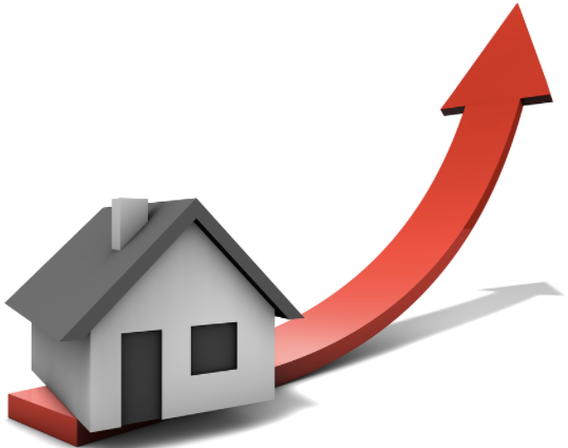 Property transactions rose by 1% y-o-y to 6,333 units in 2016, according to the National Statistical Institute (STATEC).. 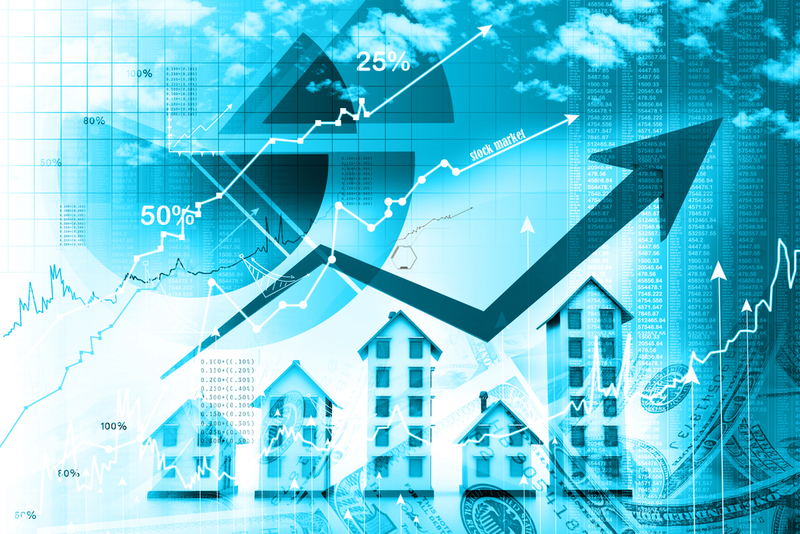 Existing apartments´ average price rose by 7.3% y-o-y to €4,795 (US$ 5,331) per sq. m. in 2016. New apartments´ average prices rose by 8.3% y-o-y to €6,051 (US$ 6,727) per sq. m. in 2016. Construction is up. The number of one-dwelling residential permits rose 11.2% y-o-y in 2016, according to STATEC, and permits for two or more dwelling residential buildings rose 15.6% y-o-y. The taxable rental value has been abolished. €1,000 (previously at €750) in the subsequent years. The home saving contributions ceiling tax deductible has been doubled, from €672 to €1,344 for individuals aged 40 years old and below. The €672 ceiling will still be applicable to taxpayers above 40 years old. For house sellers, the government has reduced the capital gains tax rate from 50% to 25%, for real property sales between July 1, 2016 to December 31, 2017. The property should have been owned by the taxpayer for at least two years. Capital gains from the sale of a main residence are not taxable. Interest rates for mortgage lending in Luxembourg are at historic lows, declining to 1.93% in Q4 2016, from 1.96% the previous quarter, and from 2.03% from Q4 2015, according to the Banque Centrale du Luxembourg (BCL). The lower interest rates are aligned with the ECB´s key rate, which remains at 0% having most recently been cut in March 2016 from 0.05%. Luxembourg is not a city where you can expect to make your fortune by owning and renting out property. Rental yields are quite low. According to the Global Property Guide research in March 2014, a 50 sq. m. apartment in Luxembourg, which has an average price of around €6,460 (US$ 7,181.58) per sq. m., can yield by around 4.63%. Bigger apartments have lower yields. For instance, a 120 sq. m. apartment, which costs at around €6,621 (US$ 7,360.57) per sq. m., has an average yield of 4.11%. In Luxembourg, the average house rent rose by 4.85% during the year to Q3 2016, according to the Ministere du Logement, and apartment rents rose by 4.85%. In Q3 2016, the average advertised rent for houses was €2,798 (US$ 3,111) per month or around €14.64 (US$ 16.28) per sq. m., while for apartments the average advertised rent was €1,430 (US$ 1,590) per month, or around €20.38 (US$ 22.66) per sq. m., based on data from the Ministere du Logement. Advertised rents in Luxembourg City, the country´s capital, are higher than the national average. The average advertised rent for houses in Luxembourg City was €4,193 (US$ 4,661) per month or €19.14 (US$ 21.28) per sq. m., with apartment average rents at €1,695 (US$ 1,884) per month or €24.12 (US$ 26.81) per sq. m.
According to the Ministere du Logement, during the third quarter of 2016, 45% of all apartment rental ads, and 24% of housing rental offers were in Luxembourg City itself. Most people live owner-occupied properties, with an owner-occupancy rate of 72.5% in 2014, according to the European Mortgage Federation (EMF). Tenants’ rights are well protected. Most property is rented unfurnished, but for furnished properties, the rent cannot be more than double the previous rate. Rents can only be increased every three years. From 1999 to 2016, Luxembourg´s mortgage debt-to-GDP ratio more than doubled, from around 22.3% of GDP to 48.3% of GDP. The surge in mortgage loans was especially strong from 2000 to 2007, before the global economic downturn, when house purchase loans were rising by double digits annually, averaging 15.3% per annum. Despite the economic downturn in 2008 and 2009 mortgage market growth continued, albeit at a slower pace. In 2016, the value of outstanding housing loans increased by 7.1% to around €25.94 billion (US$ 28.68 billion), following housing loan growth of 6.9% in 2015, 6.8% in 2014, and 6.6% in 2013. According to the European Mortgage Federation (EMF) the loan growth in Luxembourg´s mortgage market has helped push up house prices, and is due to the general easing of lending criteria by banks in the Euro area. The total number of dwelling permits rose by 6.3% y-o-y to 4,846 units in 2016, based on the figures from the National Statistical Institute (STATEC). Most of the increase came from apartments, with permits surging by around 24.5% to 3,440 units. Permits for houses were also up by 11.2% to 1,265 units in 2016. Luxembourg´s economy has enjoyed robust economic growth during the past four years. 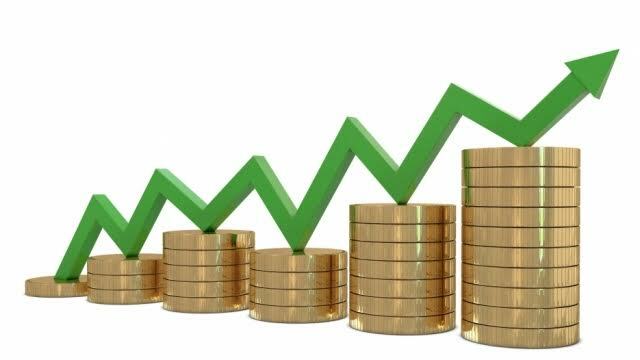 In 2016, the country´s GDP expanded by 4.2%, slightly above its 4% GDP expansion the previous year, according to STATEC. Luxembourg had an average annual GDP growth of 5% from 1999 to 2007. However, it entered recession and its GDP fell 1.3% during 2008. The recession worsened in 2009, when the economy contracted by 4.4%. Its subsequent recovery was cut short by the eurozone crisis which dragged the economy back into recession in 2012. That year´s 0.4% GDP contraction was followed by robust GDP growth of 4% in 2013, 5.6% in 2014, and 4% in 2015. In 2017 “The national and European indicators continued to send out very positive signals,” according to STATEC. The EC forecasts that the tax reform will significantly improve households´ disposable incomes and purchasing power this year, causing a rebound in domestic demand. The legacy of the recession years is relatively high unemployment. In March 2017, Luxembourg´s unemployment rate was 6%, down from 6.5% in March 2016, according to STATEC. Unemployment is expected to decline further. “The buoyant economic environment will support job creation, which is projected to remain robust both in 2017 and 2018,” according to STATEC. In April 2017, annual inflation was at 1.9%, up from 1.8% in March and from 0.07% the same month last year. The EC predicts that this year´s inflation will be close to 2% due to the recovery of oil prices and other domestic factors. Luxembourg’s economy has enjoyed robust economic growth during the past four years. In 2016, the country’s GDP expanded by 4.2%, slightly above its 4% GDP expansion the previous year, according to STATEC. Luxembourg had an average annual GDP growth of 5% from 1999 to 2007. However, it entered recession and its GDP fell 1.3% during 2008. The recession worsened in 2009, when the economy contracted by 4.4%. Its subsequent recovery was cut short by the eurozone crisis which dragged the economy back into recession in 2012. That year’s 0.4% GDP contraction was followed by robust GDP growth of 4% in 2013, 5.6% in 2014, and 4% in 2015. In 2017 “The national and European indicators continued to send out very positive signals,” according to STATEC. The EC forecasts that the tax reform will significantly improve households’ disposable incomes and purchasing power this year, causing a rebound in domestic demand. The legacy of the recession years is relatively high unemployment. In March 2017, Luxembourg’s unemployment rate was 6%, down from 6.5% in March 2016, according to STATEC. Unemployment is expected to decline further. “The buoyant economic environment will support job creation, which is projected to remain robust both in 2017 and 2018,” according to STATEC. In April 2017, annual inflation was at 1.9%, up from 1.8% in March and from 0.07% the same month last year. The EC predicts that this year’s inflation will be close to 2% due to the recovery of oil prices and other domestic factors. Existing apartments’ average price rose by 7.3% y-o-y to €4,795 (US$ 5,331) per sq. m. in 2016. New apartments’ average prices rose by 8.3% y-o-y to €6,051 (US$ 6,727) per sq. m. in 2016.